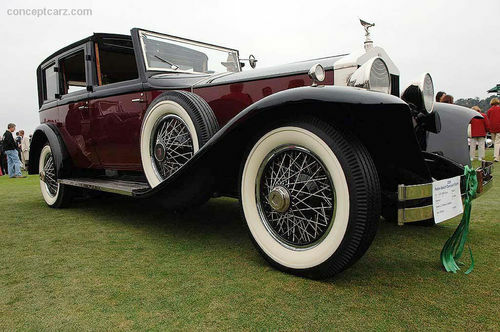 This is a model of a `1933 PACKARD, After I developed an easy way to make the 24 spoke wheels in my previous project I want to make a WOW model to put them on. 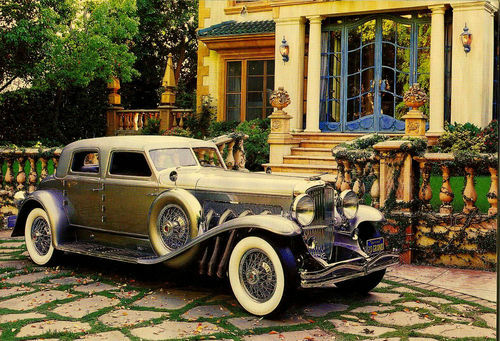 I looked into a 1935 Deusenburg but ended up with the 1933 Packard. Another purpose of doing this model was to demonstrate how to make very realistic models easily without a plan. Plans are OK but can be very time consuming, and I think in one area and improvement could be made. I believe I demonstrated this before to some extent, but this time I made construction video’s that I would like to share with you. I first find a side view picture on the internet. just choose a make and year of a vehicle you want to make, the possibilities and endless. Plans are limited to what someone else wanted to build. Then enlarge the picture to the size of on your picture matches the size of the wheels you have. I use 2 inch wheels. 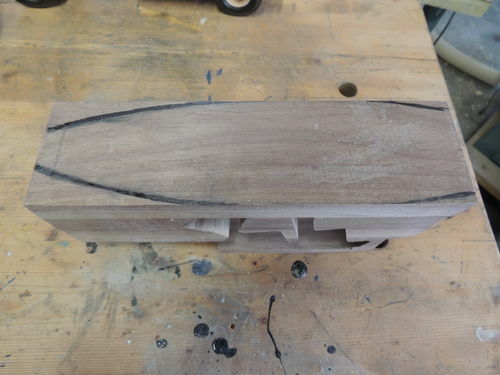 Cut the basic shape out and laminate a block of wood up so it fits on, making sure there is not a glue line going through the hood line. 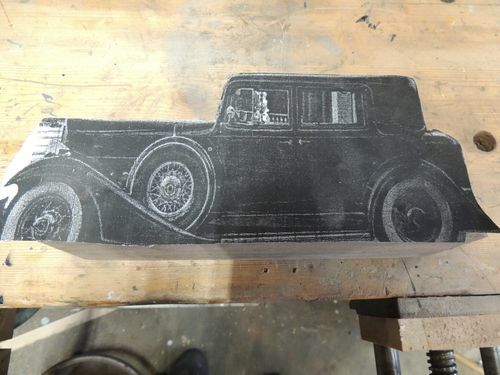 Lay out free hand the shape of the interior of the car and cut out on the bandsaw. For this car I curved the sides of the block back to front to the size of the radiator. 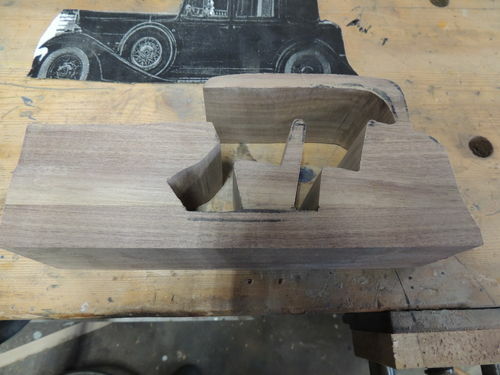 In previous models I made straight sides and then sharply tapered it to the radiator. I wanted to improve the looks for this model. 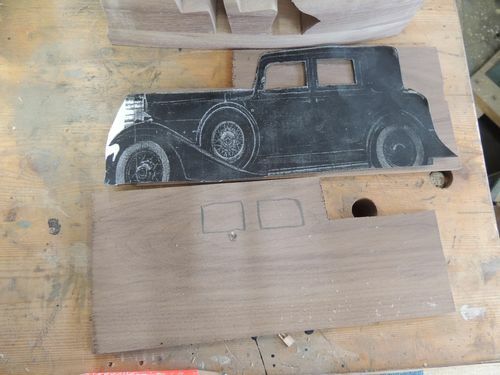 Then for this model I cut 1/8 slabs of wood the size of the car, cut the windows out of the paper picture and traced their position on the wood, then cut the windows out on the scroll saw. 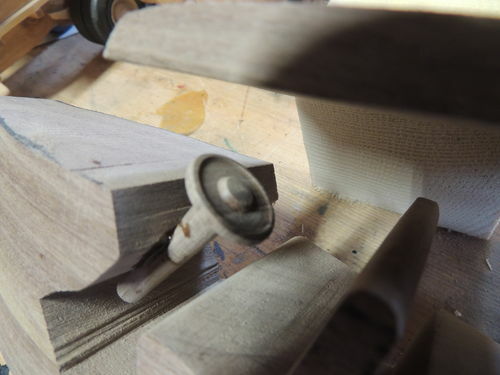 Then using the outline of the body make some clamping blocks out of scrap wood, it is easier to glue each side separately. Shape the body now ready to make the fenders, Most fenders on plans are not realistic as they have straight lines and do not curve into the body. 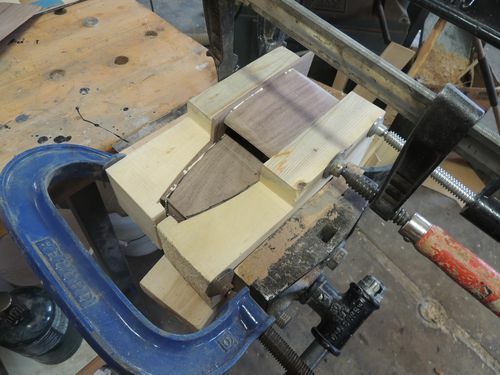 One starts the fenders by cutting there shape from the paper picture, tracing it on a board, then cutting out with the bandsaw. A wedge has to be made to match the curve of the body as it tapers to the radiator. this is explained on the video. 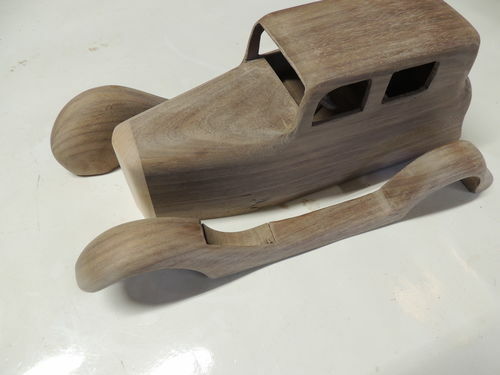 Making the fenders this way is easy and allows you to curve the fenders just like the car or truck you are modeling. After that one just has to attach the wheels, make accessories such as lights and horns. Notice how the one can curve the fenders down towards the frame as they where done back then. You will then have a model that is very realistic. Thanks for looking, I hope this give the model makers some ideas. 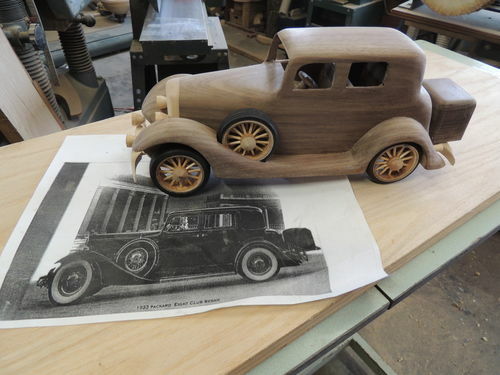 Real masterpiece…I love that brown wood ona car body. Oh Brian, that’s one beautiful model sir, love it. I’ve always wanted one of these, Brian. Somewhere in my computer, I have tons of photos of such things. I can’t seem to find them. So, in lieu of that, I offer a link to where I took all the photos can’t find. You may find it of use. If ever you’re down here, you WILL get with me for a visit there, now that I know you like these kind of things. Oh. By the bye: Your model looks really nice. I tried, several years ago, to make a panel truck, of sorts, of my own design, for a bank. It still sits up on a shelf, halfway there, and it’s yours to take home with you when you do visit. If that doesn’t bring you running, I don’t know what will. Nice job! I’m starting to like spoke wheels more and more now I know how to make them. So easy. Incredible how we (me) tend to gravitate towards the WHEELS… taking nothing from the rest of the model, but you’ve done an ace job on the wheels. Very nice. As you know I quit using plans some time ago. Nothing wrong with plans, they get great results. Especially with pieces you can’t get measurements of. Thanks for the instructional posts. Great build of a beautiful automobile. Nice work. Love the fenders. Very beautiful work, well deserve daily top 3. keep on the good work. Very nice Brian, great looking. Absolutely wonderful. And without plans! Amazing! I had to favorite this so I can go back and study how to do this. 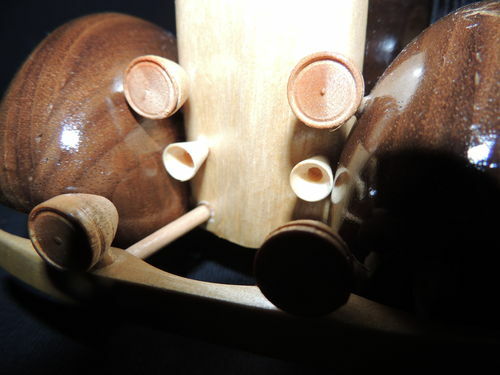 I really want to break into the wooden model world. Thanks for posting and the help!